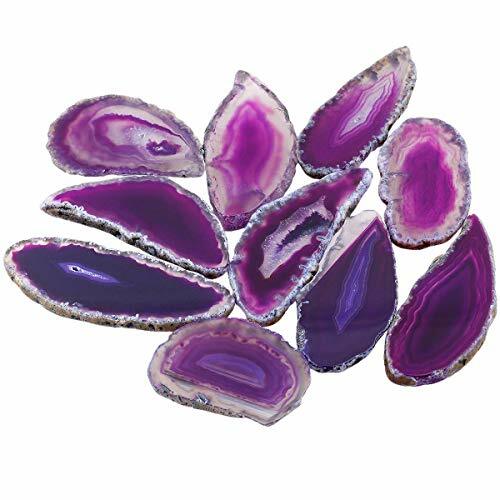 SUNYIK Purple Agate Slice Set, Geode Druzy Stone Slab Wholesale, 1"-3" in Length, Pack of 15 | What Should I Say? Manual measure approx 1"-3" long , 0.6"-1.8" inches wide, 0.2" thick. Package: set of 15, a drawstring burlap pouch comes as gift. Weighs 15-25 grams per piece. Feature: natural agate stone,vibrant color, blank agate slice, polished, undrilled, no hole, no core, no clasp, irregular shaped, some have druzy holes in middle, some may not, each agate slice will vary slightly in size and characteristics. The agate kits are sliced at different sizes,manual measure approx 1"-3" long , 0.6"-1.8" wide, 0.2" thick. Package: set of 15 (random sizes), a drawstring burlap pouch comes as gift. Weighs 15-25 grams per piece. Multiple functions: large one for place card, namecard or coaster, small one for jewelry making. The are perfect for rock collection, birthstone, wire wrapping, display, art design, healing, wedding favors, home decoration, feng shui oriental, bookend, paperweight and more. Easy care: just clean them by dry cloth, all of them have been artificially color enhanced (except the natural color option), please alway keep them dry, do not use them while sweating or carring them to the wet place. The bulk sale agate pieces are made of natural mineral, bring nature science into the class room, bring positive energy into your life. Agate slice kit makes a great housewarming, birthday, Christmas, New Year Gift.